Bruce H. Rule and an associated group of engineers and designers at the Carnegie Instituion produced the basic designs for the telescope and its rotating dome. A fork mounting with a short tube was employed, with a "flip top" to facilitate quick changes between the f/7.5 Cassegrain and f/30 coude observing configurations. (The coude focus, however, was never implemented.) 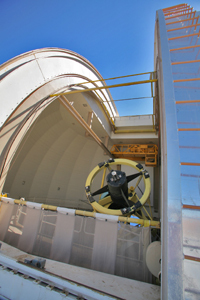 The dome is provided with a central instrument elevator or "ram" to expedite changing instruments at the Cassegrain focus and to provide for removal of the primary mirror for aluminizing.